I was at a party and met this woman with young identical twin girls. I said something to her about them being twins and she said they were actually part of triplets. I looked around for another girl and she pointed to a boy. As you know, you can't have identical triplets/twins or anything if they're different genders, so I apologized for thinking the girls were identical.... even as I'm staring at them thinking, "These kids look EXACTLY alike!" She became pregnant with a set of fraternal twins: a girl and a boy. The girl split into identical twins, giving her triplets with a pair of identical twins in the 'set'. 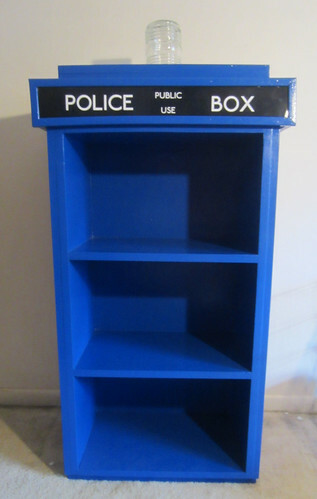 I found blueprints posted on the web on how to build a Tardis bookcase. I forwarded the link to some of my family who are also Doctor Who fans for the fun of it. I never thought of actually having one, but my sister Terry and my brother-in-law Fred got my name in our family Pollyanna and said he would make me one for Christmas. He's also making them for other people. But he didn't stop there. 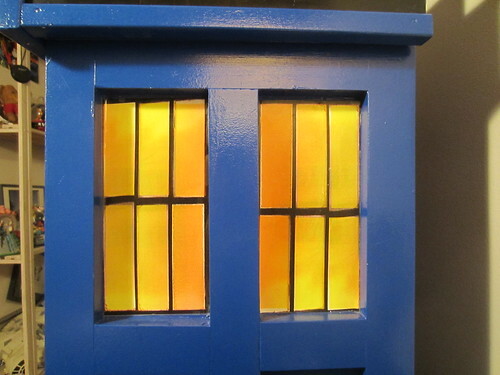 He customized it with original windows designs, a working light at the top, and sounds customized to your favorite Doctor(s) and companions, plus that Doctor's theme song and the Tardis landing! I had to show people what he built because he did an incredible job! This is how the basic bookcase looks: wonderful! 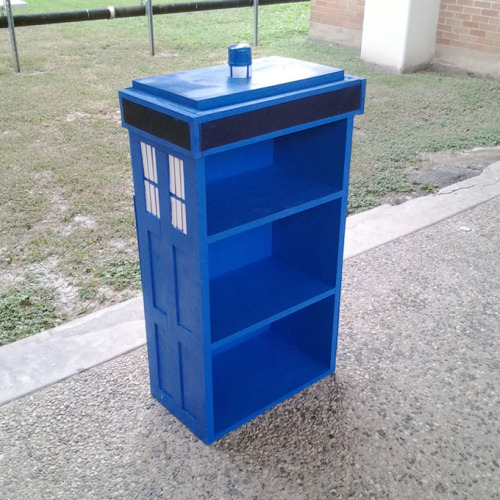 Right away, you can see differences: the Police Box sign is completely represented and a glass light at the top. The other great thing about these is they pick up lamp light in the evening and give the windows a warm glow! Fred played with a few different materials before he finalized with this combination. He did the design in Photoshop, then printed on a special paper, then played with adhesives and laminates so they flat on the box, don't peel or bubble, and again don't pick up glare from lights. Shows his attention to detail! The light isn't decorative: it works! 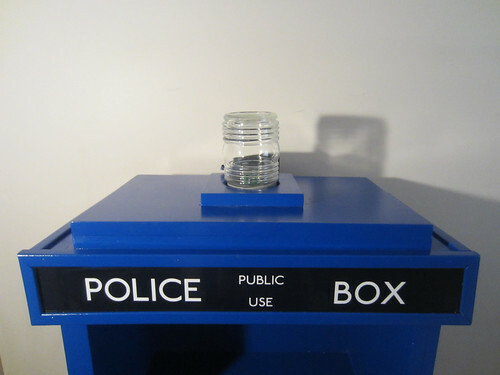 The Tardis also has a soundbox customized to a favorite Doctor or Doctors and favorite Companions! Also that Doctor's theme song and the Tardis landing! The light also isn't just a simple bulb, but a light circuit board to better represent the way the Tardis' flashes when she lands. And again, he didn't stop there! 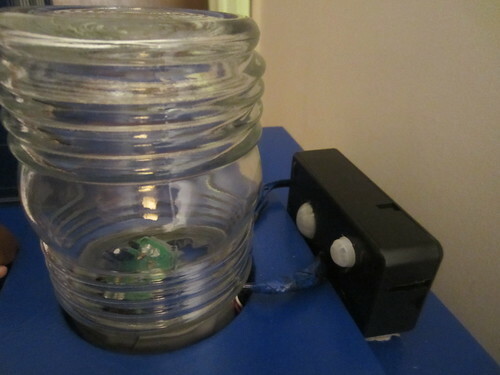 Fred elevated the light and sound mechanism with these motion detectors! They also save on battery power because the Tardis doesn't just continually play. The power controls in the back show just how much he thought it out again. First, he made these solid so there's no give when you press on them. That means it's not going to break after a little while. Like the bookcase itself, the controls are built to last! 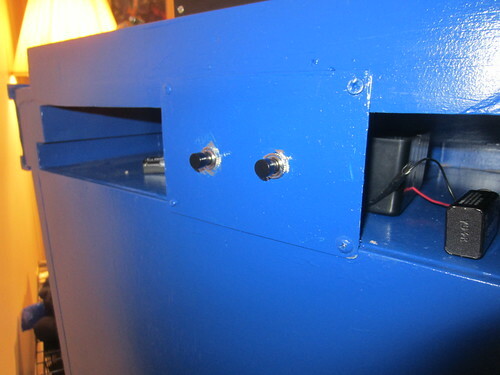 The panel also covers the wiring but leaves easy access for the battery packs. The batteries are regular 9-volt and AA, so it's inexpensive to replace them. Also, the controls mean you can completely turn off the power and save batteries. I can't thank Fred enough! 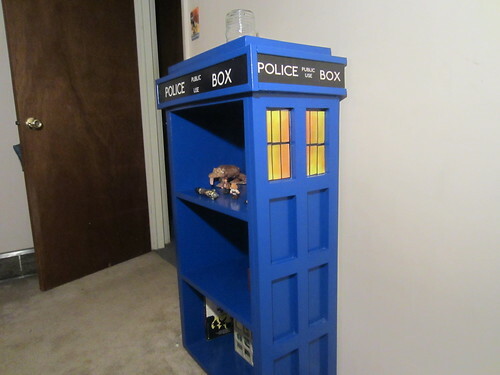 The bookcase alone is an amazing gift and then for him to do so much more... I am speechless!